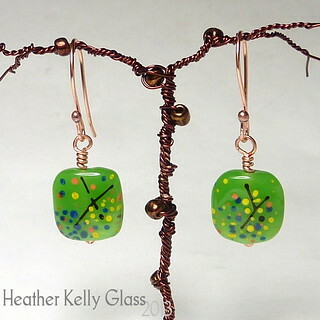 I’ve been making these little beaded charm beads during my lunch breaks: the tutorial is Charm Bead Spacers by Lynn Davy. They’re a good project if you just have a little bit of time for crafting! First of all I was playing about putting them straight on some headpins with sparkly green crystals – they looked nice that way, but maybe a little more baroque than my style? Then I wondered if they’d fit on my pvc rubber tubing – they are charm beads, after all. With the beads I used, they fit on 2mm tubing – going up a size with the seed beads should get them to fit on the 3mm, I reckon. I have some pretty lilac frosted tube that looks nicely springlike combined with the green. 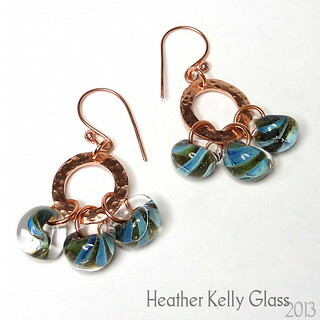 I made teardrop shapes from the tube and brass wire so that the beads have the hole horizontally. I double-wrapped the tops and put them on brass earwires. I like these! Something quick and simple this week, since I’ve been very busy! 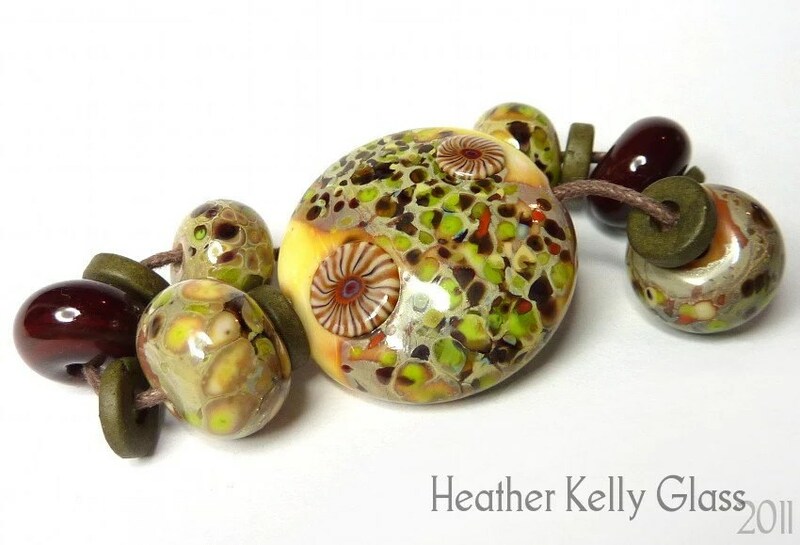 I made this pair of green lampwork beads some time ago – I used copper ball-ended headpins for the dangles and earwires, and there we are! 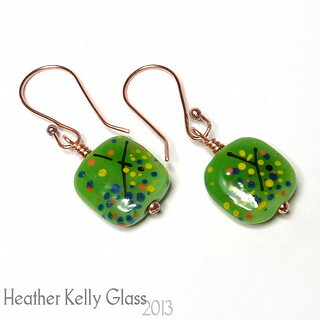 The green is CiM poison apple, a lovely bright opal green. 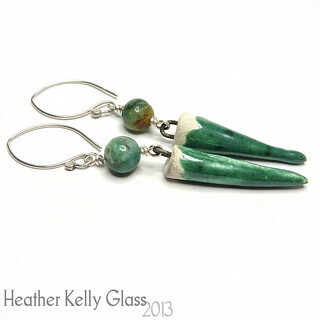 I really like putting turquoise together with bright warm and/or earthy colours. 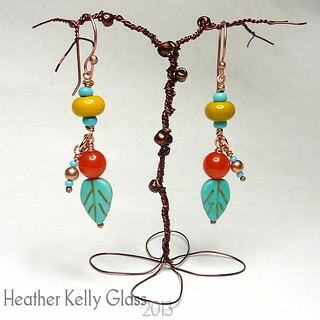 For these earrings I used turquoise leaf beads, some really bright dyed orange beads (possibly quartz – they’re cloudy), a pair of my yellow ochre lampwork spacers, two sizes of turquoise seed beads and some little copper round hollow beads. I’m not too sure about how well they hang with the extra dangles: they needed something there where the links join, but maybe I should have put an extra jumpring in there between the two main sections so there was more room. Obviously couldn’t do that after wiring them up! 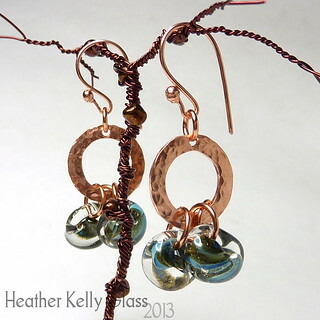 I made the copper earwires and other ball-ended headpins I used.